MACQUARIE CAPITAL vs. FRANCHISE SERVICES OF NORTH AMERICA initial complaint filed 12/12/16 seeks compensatory damages to redress FSNA’s alleged breach of an agreement to pay Macquarie a fee for services rendered in connection with a corporate transaction undertaken by FSNA; and a declaration that neither Macquarie nor any of its officers or agents breached that agreement or otherwise failed to fulfill any obligation owed to FSNA. 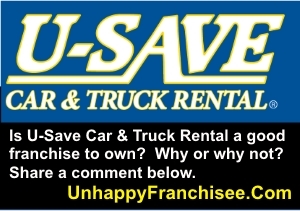 (UnhappyFranchisee.Com) Franchise Services of North America, Inc. is the parent of U-Save Holdings, Inc., franchisor of the U-Save Car and Truck Rental franchise chain. It relates (indirectly) to disputes arising from the purchase of Dollar Thrifty Automotive Group, Inc. by Hertz, one of the world’s largest rental car providers. Please feel free to provide comments, clarifications and updates in the comment section below. MACQUARIE CAPITAL (USA) INC., Plaintiff, vs. FRANCHISE SERVICES OF NORTH AMERICA, INC., Defendant. 1. This is an action for: (a) compensatory damages to redress FSNA’s breach of an agreement to pay Macquarie a fee for services rendered in connection with a corporate transaction undertaken by FSNA; and (b) a declaration that neither Macquarie nor any of its officers or agents breached that agreement or otherwise failed to fulfill any obligation owed to FSNA. 2. In an Agreement and Plan of Merger among various parties, including FSNA and Macquarie, dated July 13, 2012 (the “Merger Agreement”), FSNA agreed to pay Macquarie an arrangement fee of $2.5 million (the “Arrangement Fee”) and other good and valuable consideration in exchange for Macquarie providing funding and expertise FSNA required to complete its acquisition from Hertz Global Holdings, Inc. (“Hertz”) of Advantage Rent-A-Car d/b/a Simply Wheelz (“Advantage”), a Hertz subsidiary. Although Macquarie performed its obligations under the Merger Agreement in every particular, FSNA has refused to pay the Arrangement Fee. Moreover, FSNA has threatened to file claims relating to the Merger Agreement against two officers of Macquarie despite knowing that such claims are entirely without merit. Further, although the Merger Agreement contains New York forum selection and choice-of-law provisions, FSNA has threatened to file those claims in federal district court in Mississippi. This action follows. 3. Macquarie is a Delaware corporation having its principal place of business in New York, New York. Macquarie provides a broad range of financial services, including investment banking services. 4. FSNA is a Delaware corporation having its principal place of business in Ridgeland, Mississippi. At all times relevant to this Complaint, FSNA was a franchisor of low-cost vehicle rental stores, offering such franchises through its subsidiaries under the “U-Save” brand. 5. This Court has jurisdiction over this action pursuant to 28 U.S.C. § 1332 because complete diversity of citizenship exists between the parties and Plaintiff’s damages are in excess of $75,000. 6. Venue is appropriate in this judicial district under 28 U.S.C. § 1391(a) because Plaintiff resides in this district and the Merger Agreement at the center of this action, which was negotiated from Plaintiff’s New York office, contains a provision expressly requiring that all suits arising from it be brought in this District and be resolved according to New York law. 7. In 2012, Hertz, one of the world’s largest rental car providers, announced its intention to acquire a competing rental car operator, Dollar Thrifty Automotive Group, Inc. (“Dollar Thrifty”), which offers low-cost car rentals. 8. As a condition of not challenging that acquisition on antitrust grounds, the Federal Trade Commission (“FTC”) required Hertz to divest itself of Advantage. Thereafter, FSNA and other car rental companies sought to acquire Advantage from Hertz. 9. FSNA, however, lacked the capital and financial expertise necessary to make a successful bid for Advantage. 10. In its effort to find a capital partner, FSNA approached Macquarie to assess its interest in joining FSNA as a partner in acquiring the “Advantage Assets” from Hertz. 11. The parties negotiated a transaction that involved, among other things, the purchase of Advantage by Adreca Holdings Corp., a subsidiary of Macquarie (“Adreca”), with funding from Boketo LLC, an affiliate of Macquarie (“Boketo”), to be followed by the merger of Adreca with and into FSNA. In consideration for funding the acquisition, Macquarie’s affiliate, Boketo, was to obtain an equity interest in FSNA. 12. Section 9.12 of the Merger Agreement provided that FSNA would pay Macquarie the $2.5 million Arrangement Fee in cash after the merger was complete. In keeping with that provision, on March 28, 2013, Macquarie provided FSNA with an invoice for the Arrangment Fee, payable by no later than the date upon which that merger was completed successfully. The FSNA Board of Directors approved the merger of Adreca into FSNA at a meeting held on May 3, 2013, and the $2.5 million Arrangement Fee became due and payable on that date. Nevertheless, FSNA has failed and refused to pay the Arrangement Fee, which remains due and owing. 13. As part of the acquisition of Advantage, which the merger was designed to facilitate, Hertz and FSNA entered into a Credit Agreement (the “Credit Agreement”) providing that, after closing the sale of Advantage to Adreca, Hertz would make available to Advantage a $45 million line of credit (the “LOC”) on certain terms and conditions. 14. Section 4.02(e) of the Credit Agreement established a “Lease Balance Threshold” below which the aggregate net book value (“NBV”) of leased vehicles had to fall before FSNA could draw on the $45 million line. That condition on the LOC’s availability (the “Condition Precedent”) was introduced into the Credit Agreement in a revised and redlined draft of that document circulated by Hertz’s counsel on December 10, 2012. The same day, the revised and redlined draft of the Credit Agreement was sent to various representatives of FSNA, including Brook Edinger (“Edinger”), its outside counsel, and Robert Barton (“Barton”), its President and Chief Operating Officer. 15. On December 10, 2012, approximately 1½ hours after Hertz circulated the redline of the revised draft of the Credit Agreement that introduced the Condition Precedent, Edinger advised Macquarie executive Daniel Boland (“Boland”) and others at Macquarie that FSNA would defer to Macquarie on the changes. 19. The following morning, FSNA approved and signed the final deal documents and Boland and Donaldson signed the Credit Agreement on behalf of Advantage. Edinger circulated the signature pages to the documents by email on which McDonnell, Barton and Moore were all copied. 20. Thus, FSNA’s in-house and outside counsel, its senior executives, and its Chairman of the Board were all fully aware of the restrictions on FSNA’s ability to draw down on the $45 million line of credit, including the Condition Precedent reflected in Section 4.02(e) of the final, as-executed Credit Agreement. It is beyond dispute that FSNA knew that Hertz required Advantage to satisfy the Lease Balance Threshold by returning $125 million of NBV of cars before it could borrow on the facility. In addition, FSNA knew that it might have to obtain bridge financing before accessing the LOC. 21. 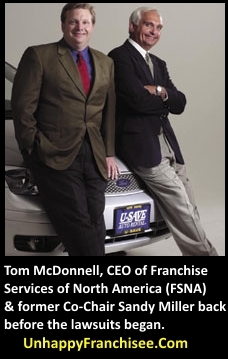 FSNA subsequently failed to satisfy the Lease Balance Threshold, was unable to access the LOC, and placed Simply Wheelz into bankruptcy on November 13, 2013. 22. On June 29, 2015, FSNA filed a Complaint seeking a Bill of Discovery (the “Discovery Complaint”) against Donaldson—whose employment by Macquarie had by that time been terminated—in the Chancery Court of Madison County, Mississippi, Franchise Services Corporation of North America, Inc. v. Donaldson, 45 CH 1:15-cv-00601 (the “Discovery Action”). The Discovery Complaint alleged that: (a) Donaldson had contacted FSNA’s attorneys and communicated to them certain information that led FSNA to conclude that it may have meritorious causes of action against two Macquarie executives; (b) Donaldson had not fully disclosed his knowledge or provided copies of documentary evidence in his possession to FSNA’s attorneys; (c) Donaldson would not disclose his knowledge or provide his documents absent a Court order; and (d) the knowledge and documentary evidence in Donaldson’s exclusive possession was material and essential to the framing of a Complaint to assert FSNA’s claims against Macquarie, and to the prosecution of such claims. Based on those allegations, the Discovery Complaint sought an Order compelling Donaldson to provide documents and submit to a deposition. 23. On July 24, 2015, FSNA filed in the Discovery Action a Motion for Order Authorizing and Directing Discovery (the “Discovery Motion”). By Order dated August 5, 2015, the Court set that motion down for a hearing on November 10, 2015. 24. By letter dated August 13, 2015, FSNA’s counsel sent Macquarie and two of its executives copies of the Discovery Complaint, the Discovery Motion, the Agreed Order Setting Hearing on that motion, and a draft federal complaint (the “Draft Complaint”), venued in the United States District Court for the Southern District of Mississippi, setting forth FSNA’s claims against the Macquarie executives. The Draft Complaint alleged that the Macquarie executives surreptitiously inserted the Condition Precedent into the Credit Agreement and concealed its existence from FSNA as part of a conspiracy to earn outsize bonuses and wrest control of FSNA from its majority owner. 25. The Macquarie executives retained counsel, who met with FSNA’s counsel in Mississippi on October 26, 2015. At that meeting, the executives’ lawyers shared with FSNA’s lawyers facts and showed them documents refuting all of the Draft Complaint’s claims, including its core contention that the executives named in that Draft Complaint surreptitiously inserted and thereafter concealed the Condition Precedent from FSNA. Based on that presentation, the executives’ counsel asked FSNA to dismiss the Discovery Action. FSNA’s counsel refused to do so. 26. Given that refusal, the executives successfully moved to intervene in the Discovery Action on November 10, 2015. During that hearing, in urging the Court to grant the Discovery Motion, FSNA’s counsel argued that he filed that motion “rather than file a lawsuit that might be unmerited.” At the conclusion of the hearing, the Court held the matter over for a second hearing on the Discovery Motion. Thereafter, the executives filed a Motion to Dismiss the Discovery Complaint for failure to state a claim on which relief may be granted. The Discovery Motion and the Motion to Dismiss the Discovery Complaint were then adjourned on several occasions and remain pending. On December 5, 2016, the Court set both motions down for hearings in April 2017. 27. FSNA has not secured pre-suit discovery and possesses no more facts now than it had on November 10, 2015, when its counsel conceded that its claims against the Macquarie executives “might be unmerited.” Nevertheless, in a telephone call on December 9, 2016, FSNA Chairman and CEO McDonnell informed a senior Macquarie executive that FSNA intends to file suit against the Macquarie executives forthwith. Based on the Draft Complaint, the suit to which McDonnell was referring (a) will make the same patently meritless claims contained in that pleading—i.e., that the Macquarie executives surreptitiously inserted the Condition Precedent in the Credit Agreement without FSNA’s knowledge, as part of a conspiracy to earn bonuses and capture control of the company, and that FSNA would have sought bridge financing if it had been aware of the Condition Precedent—although more than one year ago, the executives’ counsel drew FSNA’s attention to undisputed facts and documents refuting those claims; and (b) will be filed in the United States District Court for the Southern District of Mississippi, where the Draft Complaint is captioned, despite the Merger Agreement’s forum selection clause. 28. Macquarie repeats and realleges the allegations contained in Paragraphs 1 through 27 of this Complaint as though fully set forth herein. 29. In failing and refusing to pay the $2.5 million Arrangement Fee, FSNA breached a contractual obligation to Macquarie. 30. As a direct and proximate result of that breach of contract, Macquarie has been damaged in the amount of $2.5 million. WHEREFORE, Macquarie demands judgment against FSNA in the amount of $2.5 million plus interest, attorneys’ fees, costs of suit, and such other and further relief as the Court deems just and equitable. 31. Macquarie repeats and realleges the allegations contained in Paragraphs 1 through 30 of this Complaint as though fully set forth herein. 32. Although FSNA breached its contractual obligations to Macquarie under the Merger Agreement as set forth in this Complaint, Macquarie has honored its obligations to FSNA under that agreement in every particular. 33. Nevertheless, as set forth above, FSNA has announced that it intends to sue Macquarie executives on the grounds set forth in the Draft Complaint. 34. FSNA’s announcement of its intention to sue Macquarie executives for the manner in which they discharged their duties and responsibilities as such makes clear that there is a present, ripe controversy between the parties. 35. As explained above, FSNA’s threatened action against Macquarie’s executives would be entirely lacking in merit. 36. Macquarie has no adequate remedy at law to prevent FSNA’s threatened action against its executives. WHEREFORE, Macquarie demands judgment against FSNA declaring that Macquarie and its executives have no liability to FSNA arising out of, related to, or in way connected to the Merger Agreement, and awarding Macquarie attorneys’ fees, costs of suit, and such other and further relief as the Court deems just and equitable. Attorneys for Plaintiff Macquarie Capital (USA) Inc.
Tom McDonnell, U-Save Holdings, Inc., Franchise Services of North America Inc. (FSNA): All individuals and companies discussed on this site are invited to provide clarifications, corrections, rebuttals or other statements for publication and linking from the original content. Email us at UnhappyFranchisee[at]gmail.com. You may also participate in the comment section of any page. Not much support from the USave Car & Truck Rental. The franchise is weak at best. My opinion, Do not waste your money with this franchise. You’ll lose money. I do not believe they will survive as one of their directors has mentioned bankruptcy.